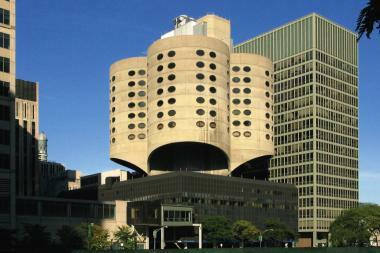 Prentice Women's Hospital on Northwestern University's medical campus in Streeterville. CHICAGO — Preservationists fighting for Northwestern University to abort plans to demolish Prentice Women's Hospital and build a new, high-tech medical facility say the school can accomplish its goals in the existing structure. The Save Prentice Coalition unveiled four design plans for repurposing the existing Prentice structure, each of which they say would exceed the university's stated job creation and revenue generation goals. Northwestern says redeveloping the land according to their proposal will create 2,500 construction jobs, 2,500 full-time jobs and will stand to contribute $390 million in net economic impact for Chicago once the research facility is operational. The university's current plan involves razing the Prentice structure and starting fresh. In May 2011, a consulting firm hired by NU reported that it was impossible to renovate the existing building to meet current research needs. A rendering from the alternative Prentice development plan designed by Loebl, Schlossman & Hackl. At a press conference at the American Institute of Architects headquarters Thursday morning, architecture firms BauerLatoza Studios, Kujawa Architecture LLC, Loebl Schlossman & Hackl and architects Cyril Marsollier & Wallo Villacorta each presented their own, alternative development plans, which are also published online. 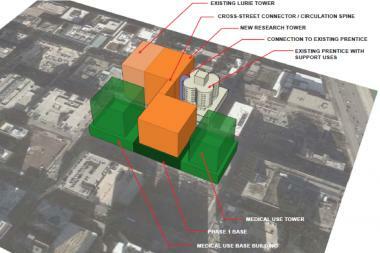 Their plans propose variations on an update that they claim will exceed Northwestern's job creation and revenue goals. “By reusing Prentice and building adjacent research space, Northwestern could support nearly 1,000 more permanent jobs and generate over $1 million in additional annual tax revenue for the citizens of Chicago," Jim Peters, former Deputy Commissioner of the Chicago Department of Planning and Economic Development, said in a release. A spokesperson for the university said they hadn't been contacted about these proposals. The four alternative plans promise to meet the university's base needs of 1.2 million total gross square feet, 15 foot floor-to-floor heights, 40,000 square feet of vivarium space and expanded research space via new construction in the space surrounding Prentice's iconic towers. The university previously rejected a proposal to refurbish the hospital building in November, arguing that the current structure was too small and too outdated to meet its needs for a large, high-tech research space. Northwestern spokesman Al Cubbage said the university won't be looking at plans for new construction until a lawsuit filed against them by preservation groups is adjudicated.